DataDefractor SSIS Developer works within the SQL Server Developer environment to convert complex spreadsheets directly into structured SSIS data flow output. Data can be input through Excel, SQL Server, Oracle, Access, CSV and other flat files, and ODBC. This is a single machine, unlimited user license policy intended for development purposes only. DataDefractor SSIS Developer can be purchased for $295 per year. DataDefractor SSIS Enterprise works within the SQL Server environment to convert complex spreadsheets directly into structured SSIS data flow output. Data can be input through Excel, SQL Server, Oracle, Access, CSV and other flat files, and ODBC. This is a single machine, unlimited user license policy intended for both production and development purposes. DataDefractor SSIS Enterprise can be purchased for $995 per year. DataDefractor Solo is an ETL independent edition of DataDefractor to transform your business spreadsheets and reports into structured flat-file data marts. 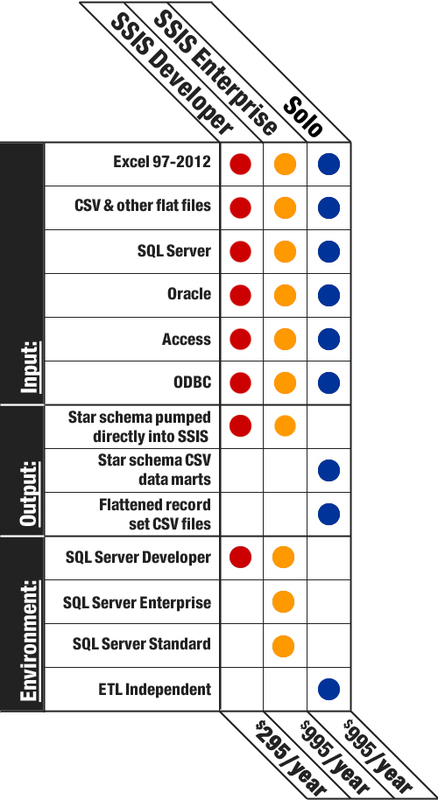 Data can be input through Excel, SQL Server, Oracle, Access, CSV and other flat files, and ODBC. This is a single machine, unlimited user license policy that includes DataDefractor Data mapping Wizard and Command Line Interface. DataDefractor Solo can be purchased for $995 per year. Not ready to buy? Download our 14-Day Free Trial!